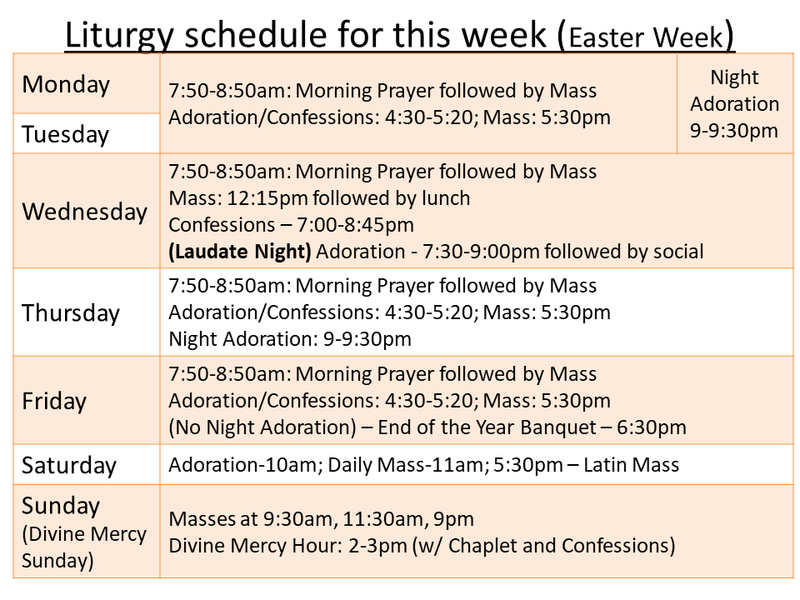 See bottom of page for the liturgy schedule for this week. 6:30pm: Easter cookout with a casceron (confetti egg) bash sponsored by our Catholic Daughters of the Americas court! ~12:45pm: Fellowship lunch following 12:15pm daily Mass. 7:30pm: Men&apos;s Miles Christi group. Meet in St. Cecilia room (back left). 6:30pm: End of Year banquet! Free dinner (from Baris Italian restaurant), dessert, and door prizes. Our fabulous year-end award ceremony and a dance to follow dinner! Send graphics and event details to marlene[at]baylorcatholic.org and jessicasmith[at]baylorcatholic.org or message us on the St. Peter Slack Group. Include date, time, and other relevant details like if it&apos;s a men&apos;s/women&apos;s event, discussion topic, if an RSVP is needed, or maybe if there will be food. :) We&apos;ll add it to this page and share on social media.